Ultrasonic Cutting is designed to cutting and deburring of plastic, cutting of sheet, cloth,thermoplastic films, rubber woven and non-woven fabric, Beautiful cutting finish is made for cutting out designs and patterns on rubber, POP sheet, paper, etc. Ultrasonic Cutter Application for which guys? 4. Stable operation, bring good surface craf. How to choose these two versions Ultrasonic Cutter? in my opinion, if you are persional users, such as plastic car toy model, various plastic boat toy models. 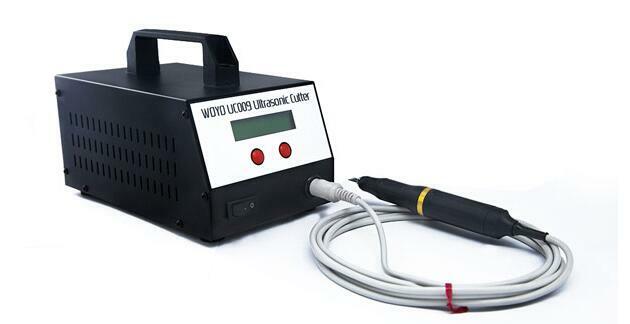 you can choose WOYO Ultrasonic Cutter TUIREL Key Cutting, but if you are Electronic engineers, big PCB manufactory or car repair workshop, you'd better choose professional tools-WOYO UC009 Ultrasonic Cutter.